With Monday’s big stock market jump and Tuesday’s even bigger selloff both being at least partially attributed to news of a US-China trade-war breakthrough—excitement the first day, followed by skepticism the next—it’s time to consider how things may play out in the trading trenches. Yesterday Asian and European stock markets followed the US to the downside—but not nearly as much—while US stock index futures closed higher after overnight trading Tuesday night and into early Wednesday morning. With US stock markets reopening today, the rubber is ready to meet the road—or, rather, the soybeans are ready to hit the bushel. Agribusiness giant Archer Daniels Midland (ADM) has been at the center of the trade-war storm, as it exports enormous quantities of agricultural goods, including soybeans and grains, to China. But all things considered, its stock has navigated the tariff turmoil pretty well. While grain prices got walloped in June as China began slapping retaliatory tariffs on US ag exports, ADM chugged higher, extending a rally that began in November 2017 and peaked with a 30-month high around $52 in early October (chart above). 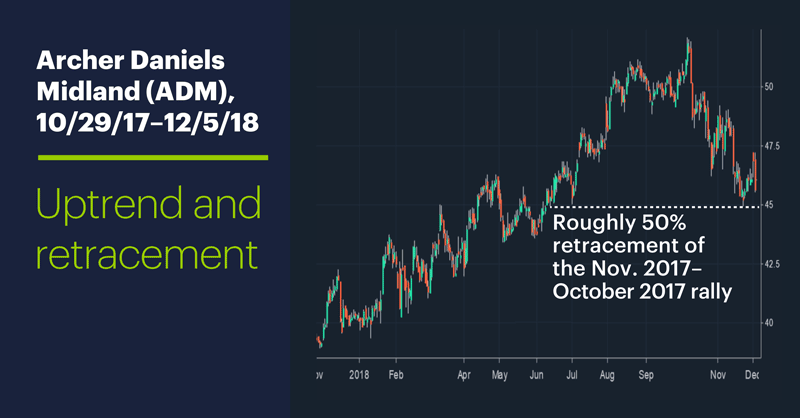 ADM actually turned in strong Q2 and Q3 quarterly numbers, thanks to its global operations and ability to sell Brazilian soybeans, along with the buying rush that occurred as importers attempted to stockpile grains before tariffs kicked in.1 The selloff that took the stock down to around $45 on November 23, which was in line with the broad market’s decline, represented an approximately 50% retracement of ADM’s November 2017–October 2018 rally. The shorter-term chart below shows the stock got a big bump (+1.78%) on Monday in the wake of the trade ceasefire news, then, with the rest of the market, gave it all back and then some on Tuesday (it rebounded a little after hours, though). Despite the worries that the trade-war ceasefire may not be all that it was initially cracked up to be,2 there is potentially cause for some near-term optimism, as reports also emerged on Tuesday that China was getting ready to begin buying US soybeans again.3 And soybean and corn futures followed through with additional gains Tuesday and yesterday. “Reports” aren’t the same as having invoices in hand, but if the tariff handcuffs really are off, at least for a while, and the broad market shakes off some of its macro jitters, agribusinesses like ADM may be able to make some hay. 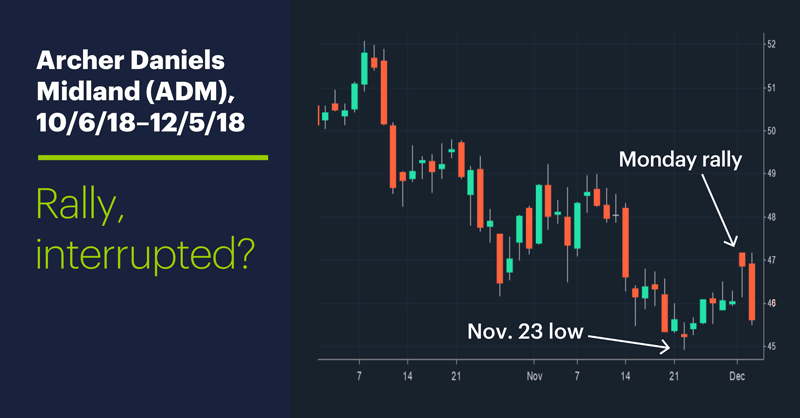 But that November 23 low is likely a line in the sand for traders looking for a quick rebound. Market Mover Update: On Tuesday UnitedHealth Group (UNH) had its first significant down day since pushing to the first a few new record highs on November 28, falling 2.72%. Today’s numbers (all times ET): ADP Employment Report (8:15 a.m.), International Trade (8:30 a.m.), Productivity and Costs (8:30 a.m.), PMI Services Index (9:45 a.m.), Factory Orders (10 a.m.), ISM Non-Manufacturing Index (10 a.m.), EIA Petroleum Status Report (11 a.m.). 1 Crain’s Chicago Business. Trade tariffs benefit Archer Daniels Midland, for now. 8/8/18. 2 Fortune. 'An Incredible Deal:' Making Sense of Trump's Overblown Take on the China Trade War Truce. 12/3/18. 3 Bloomberg.com. China Is Preparing to Buy U.S. LNG and Soybeans Again, Sources Say. 12/4/18.